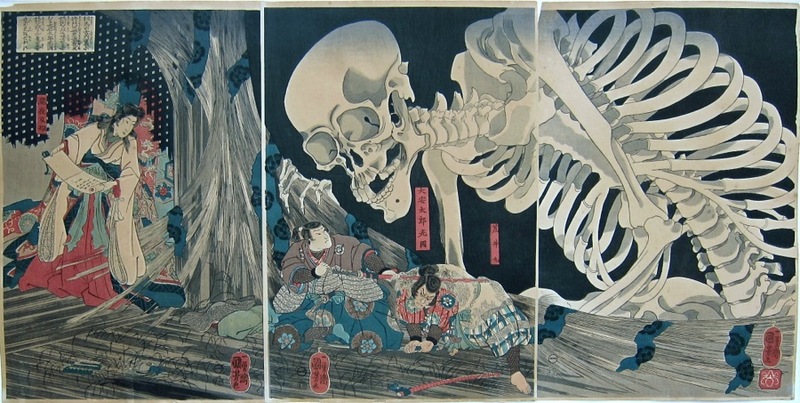 Utagawa Kuniyoshi (1797-1861) Mitsukini Defies the Skeleton Spectre Conjured by Princess Takiyasha, Later nineteenth century edition of the 1846 original. Oban triptych. Possibly the most recognisable and the most sought after of nineteenth century Japanese prints by the increasingly revered Kuniyoshi… an artist whose reach and status is beginning to stretch out of the confines of Japanese scholarship and into the wider context of popular culture. The design is a masterpiece. This edition is later, somewhere in the mid-nineteenth century, possibly a posthumous, possibly a lifetime edition. In 2007 a first edition fetched $24,000 at Christies and the price of this edition is modest by comparison. The provenence and history of these editions is very nearly impossible to trace. I should say that it is possible that some of the blocks are original; but again, it would be impossible to verify, so good are the nineteenth century recuts. 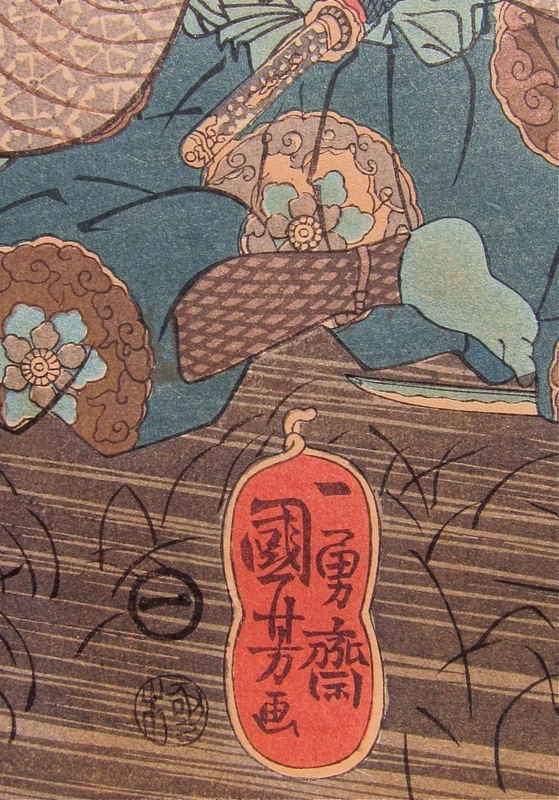 A copy of this edition is in the Baur Foundation Museum of Far Eastern Art Collection in Switzerland. The print was exhibited recently at the Odakyu Museum in Japan in the first ukiyo-e exhibition from the Baur Collection, Switzerland. It is a great print. The condition is good although there is some paper loss to the top left of the right hand sheet and there is some yellowing to the paper. The colour is good, the impression is fine. It is a fine opportunity to anyone wishing to buy a copy, albeit later edition of this icon of Japanese art. As a piece of design, it is of course peerless. The great skeleton looms out of the right hand side of the print dwarfing all else, towering above the figure of Mitsukini in the centre. The monster has been summoned amid the ruins of the palace at Soma. Princess Takiyasha stands in the left hand sheet reciting the summoning spell from a scroll in her hands. 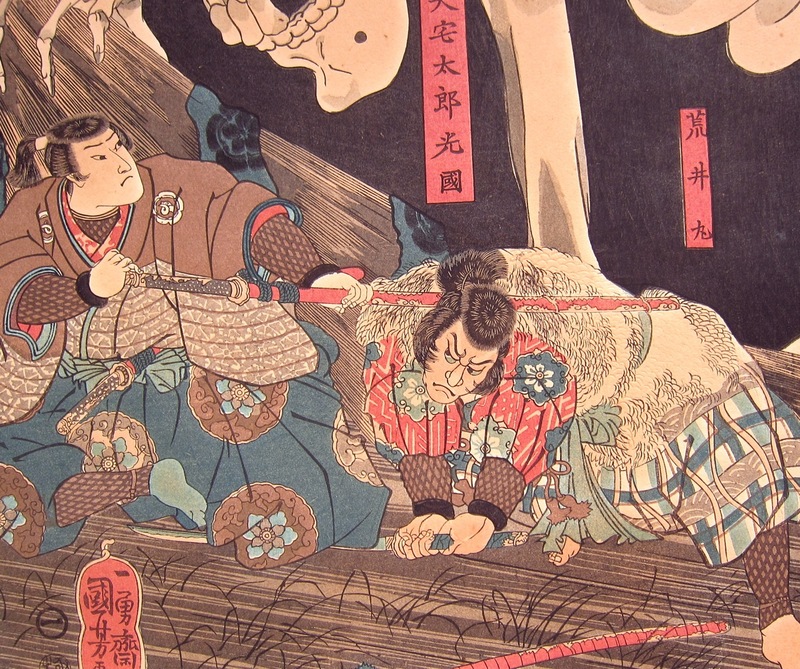 Kuniyoshi was probably inspired to make the piece after a nineteenth century publication retelling the story of the attempted insurrection by Taira no Masakado in the tenth century. Masakado built a palace at Shimoza to rival the imperial palce at Kyoto. His rebellion was put down and the palace was sacked. His daughter, the princess Takiyasha survived and became a witch. The warrior Mitsukini was despatched to end her evil reign in the area. 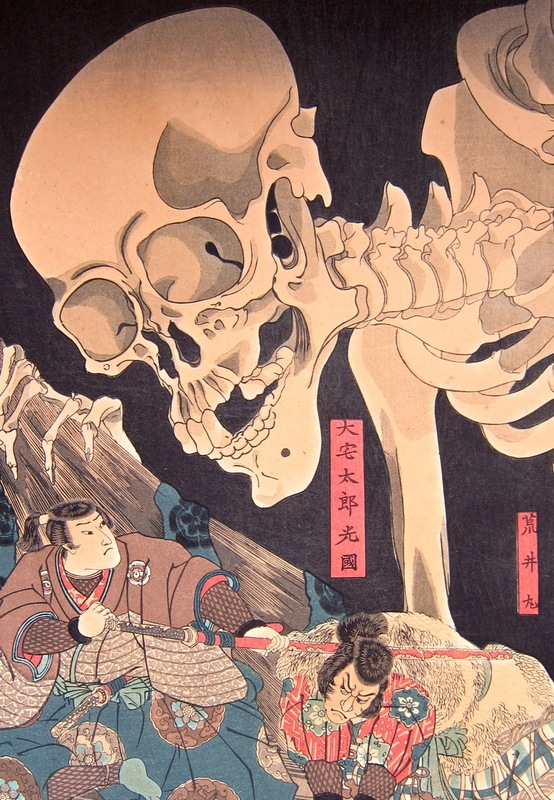 Kuniyoshi would have been influenced by Dutch anatomical engravings and and possibly by Hokusai’s engraving of the skeleton of Koheiji which shares certain aspects of this design. This is a great design, from the nineteenth century and masterpiece of Japanese art and design.